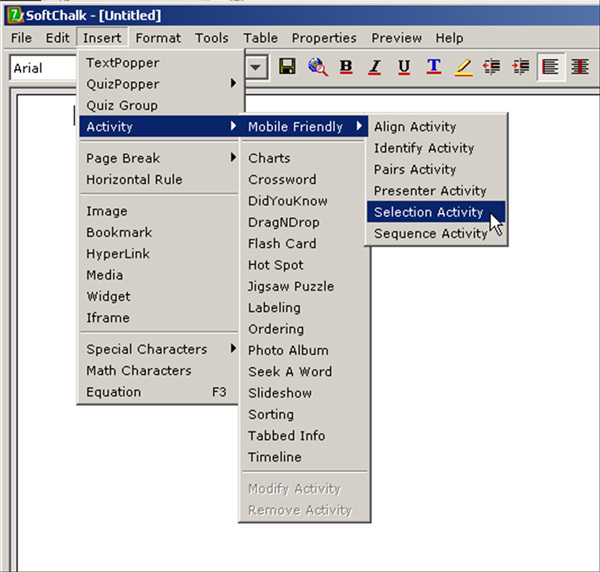 The authoring tool used is SoftChalk LessonBuilder 7 (SCLB7), a commercially available software package that enables the development of contents delivered via the Web. Mobile devices include smartphones, iPads, tablet PCs, notebook computers, and netbooks. There is a move to make all Web learning objects accessible on mobile devices for greater accessibility. 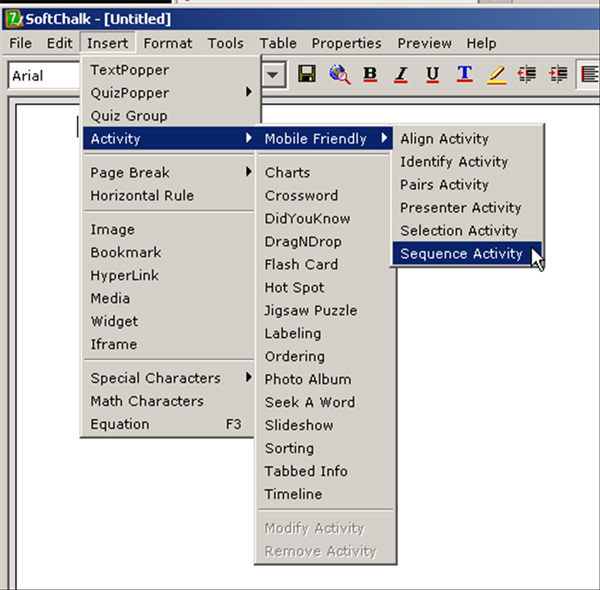 Open SoftChalk 7. Go to the Menu Bar. Go to Insert > Activity > Mobile Friendly and select the activity that you would like to create. Select Sequence Activity by clicking on it. Open SoftChalk 7. Go to the Menu Bar. Go to Insert > Activity > Mobile Friendly and select the activity that you would like to create. Select Selection Activity by clicking on it. 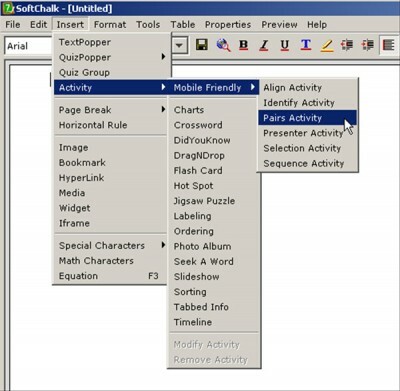 Open SoftChalk 7. Go to the Menu Bar. Go to Insert > Activity > Mobile Friendly and select the activity that you would like to create. 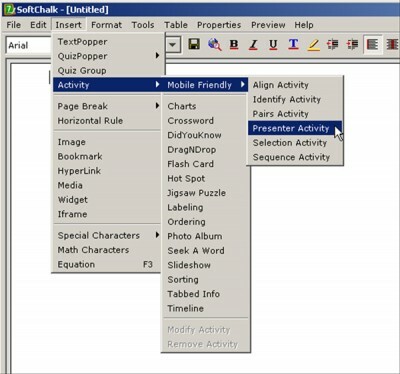 Select Presenter Activity by clicking on it. Open SoftChalk 7. Go to the Menu Bar. Go to Insert > Activity > Mobile Friendly and select the activity that you would like to create. Select Pair Activity by clicking on it. 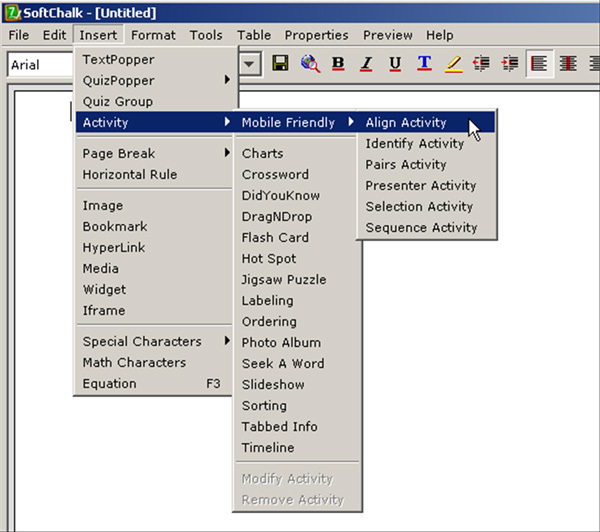 Open SoftChalk 7. Go to the Menu Bar. Go to Insert > Activity > Mobile Friendly and select the activity that you would like to create. Select Identify Activity by clicking on it. 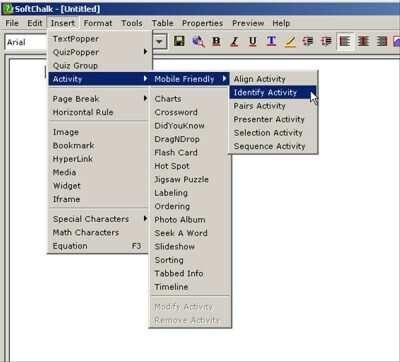 The authoring tool used is SoftChalk LessonBuilder 7 (SCLB7), a commercially available software package that enables the development of contents delivered via the Web. Mobile devices include smartphones, iPads, tablet PCs, notebook computers, and netbooks. There is a move to make all Web learning objects accessible on mobile devices for greater accessibility. Interactive Flash objects do not currently play on iPads. 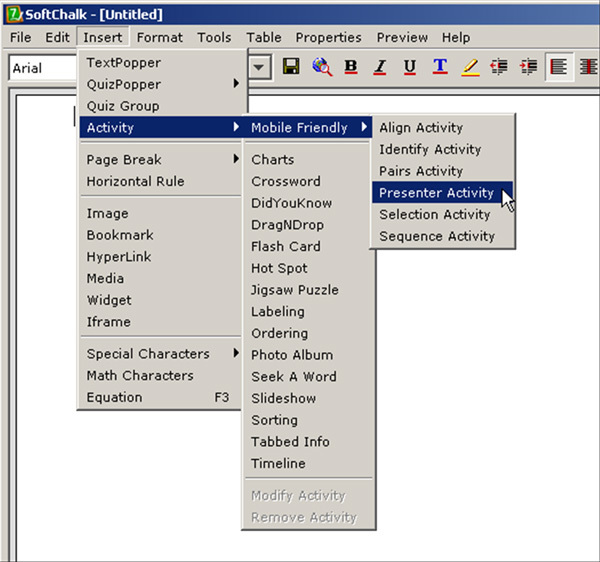 Open SoftChalk 7. Go to the Menu Bar. Go to Insert > Activity > Mobile Friendly and then select the activity you would like to create. Select Align Activity by clicking it. For any number of reasons, faculty may find they have to transfer digital learning objects or modules or whole courses from one learning/course management system (L/CMS) to another. Sometimes this is due to the closing out of a contract for a particular L/CMS. Sometimes it’s a matter of changing workplaces and moving contents (for which faculty own all or partial copyright). Sometimes faculty members need to deploy a course on a different system in order to reach a wider audience. Assuming that the digital learning objects have been built correctly (with the proper technologies and in an accessible way), various types of learning may be quite “portable.” These text files, digital imagery, diagrams, slideshows (still and animated), audio files, video files, games, tutorials, and other objects may be moved without affecting their quality.